My name is Alfredo Quezada. I have been a licensed Realtor since 2003. I have worked for the companies: Avalar R.E., ReMax and Better Homes Realty, and now I am excited to have the opportunity to be a member of EXIT Castillo Realty, part of the faster growing and high standards of EXIT Realty Corporation International that provides excellent training and support to the agents to be able to provide services of high quality to the public. I specialize in helping homeowners to sell their homes for top dollars and to purchase the home of their dreams. I really enjoy when I put the keys of a house in the hands of a new homeowner, specially when they thought they could not own a home. I specialize in the cities of: Oxnard, Ventura, Camarillo and Santa Paula but provide service to all of Ventura county and Santa Barbara county. Hablo Español. Alfredo Quezada llegó altamente recomendado por nuestra agente de préstamos. Sabíamos que está bien capacitado y que era efectivo en su trabajo, pero nadie nos preparó para la experiencia tan maravillosa que tuvimos al comprar nuestra casa. Alfredo resultó ser, no sólo conocedor de su trabajo y del área de Oxnard, sino que tiene una personalidad muy agradable y sabe conectarse con sus clientes. Siempre estuvo disponible para contestar preguntas, nos dio su opinión sincera y trabajó de manera que los resultados fueran siempre a nuestro favor. En un mes ya teníamos las llaves de la casa en nuestras manos! Fue un gran placer haber trabajado con Alfredo y, de tener la oportunidad, volveríamos a trabajar con él sin pensarlo dos veces. Alfredo Quezada went above and beyond with his service.I was very pleased with the way he handled the sale of my parent’s house. He is very professional, honest and explained every process that was to take place. I would definitely recommend him to my family and friends and he will continue to be my family’s Realtor. 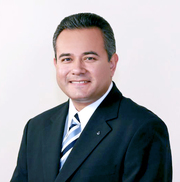 Alfredo Quezada has helped us since 2011 with selling and buying our homes. He has always been reliable, professional and willing to answer any of our questions. We will continue to rely on his services for years to come and recommend him to our family and friends. Alfredo Quezada sold our home last year.Mr. Quezada is very professional on what he does and dedicated his time and service to us 100%.We are looking forward in working with him in the future to purchase a new home. I was born in Guadalajara, Jalisco, where I lived until I finished High School at the University of Guadalajara. I moved to Oxnard in 1989 and I have lived in Ventura County since then. I love to read, watch movies and to be in contact with mother nature. I play soccer in a veteran’s league in Oxnard. Since 1992 I have worked as a radio announcer, I started working in radio in Oxnard (La Mexicana 910 AM) and since 1995 I have been in Santa Barbara, CA (La Musical 94.5 FM and Radio Bronco 107,7 FM). Hablo Español.